There are some things that can only really be done with board games. 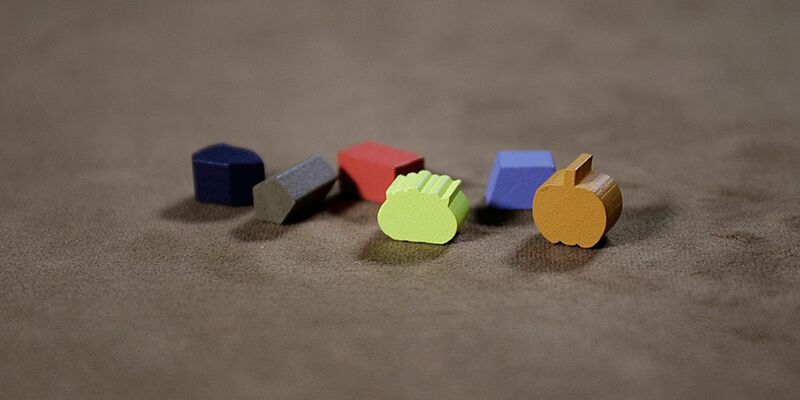 Sure, video games have their fancy graphics, and movies might have their ‘star power’, but board games not only give the player something physical to interact with, but on top of that the unhindered mechanics of board games are great both to teach design to people and also to convey messages from mechanics directly. There is one more area in which board games excel, and that is through legacy board games. Legacy board games are a type of board game that changes permanently as you play them, and Charterstone is a great example of the format. 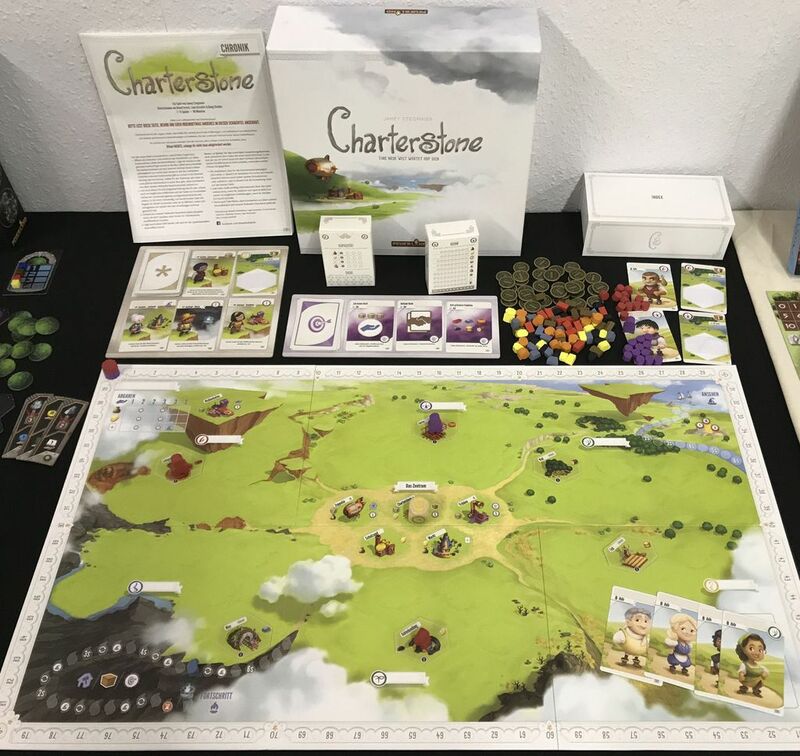 Charterstone is a competitive, legacy village-building game from Stonemaier Games and was designed by Jamie Stegmaier, the creators behind the strategy board game Scythe. You might be expecting this game to be something similar to Scythe, but for the most part, there are no similarities, at least not thematically speaking. Charterstone tells the tale of the land of Greengully, whose eternal monarch, the Forever King, has decreed that the kingdom must expand. To help with this, he has dispatched 6 chosen citizens to go out into the world and found a new village beyond the country’s boarders. Each player takes control of one of the 6 citizens, each with their own charter to watch over, as you try your best to create a thriving village. The first thing you notice when you open the box is the fact that there are a whole bunch of different miniature boxes, each with their own labels. Actually, I suppose the first thing you’re likely to notice is the big sheet of paper that says STOP on it in big, red letters. The reason for this is that you’re not supposed to open the whole box and take all of the pieces out when you get your hands on the game. Due to the legacy nature of the game, you’re not supposed to know about certain components until you actually need them, so opening up the different compartments too early will give you DREADED SPOILERS! One of the most interesting elements about the game is how you can learn to play it. 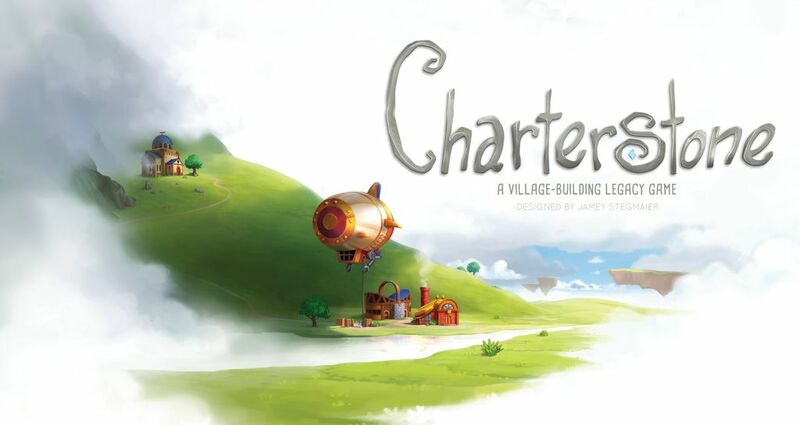 While there are the standard video tutorials and rulebooks to read with Charterstone, you can actually get started pretty much instantaneously. If you start reading the book and following along with exactly what it says, you can just start up straight away, opening up the right boxes and taking out the right pieces. It’s going to be difficult to talk too deeply about Charterstone, if only because so much of the true game experience hinges on it being a surprise for you. That is not to say that people who’ve played it through before can’t still enjoy it, but much like many other things in life, the first time is always the best. Either way, we shall try our hardest to convey the way the game works without actually spoiling any of the mechanics too much, at least none of the ones that you don’t start out with immediately. 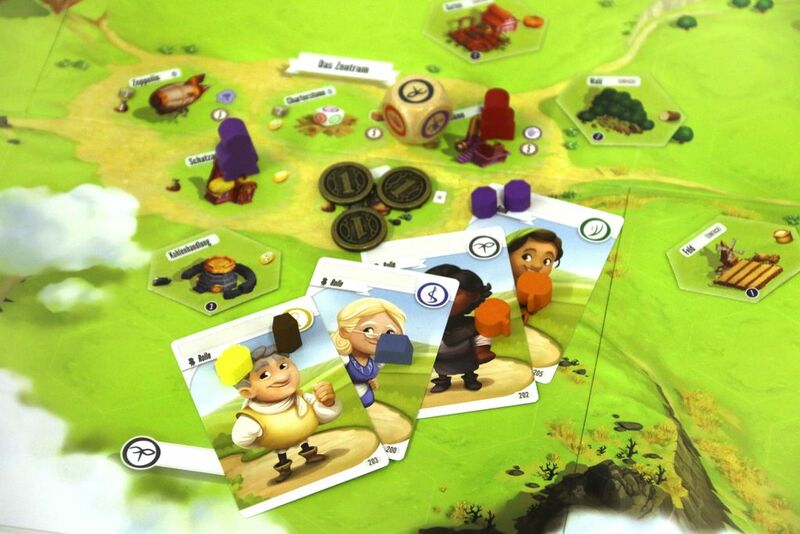 Mechanically, Charterstone is a worker placement-style game in that you have approximately two different workers, and each turn you get to place one of them on a space and then perform some sort of action, either getting a free resource or paying a combination of money and resources to complete an objective or advance your reputation, etc. Once you’ve placed both of your workers, you have to spend your turn recalling them, and then you can start to place them again. You continue to do this until the timer, in this case a meter on the board, runs down and the game ends, then the person with the higher score is the winner of the game. Charterstone takes place over a series of games, making up a campaign, so any single victory doesn’t mean that the player has quite won yet. In all there are 12 missions to complete, and with each one you can be assured of some new mechanic or game piece being revealed until the game begins to embody the complexity that we expect from modern board games. The biggest advantage to this style of gameplay is that you are slowly introduced to the mechanics as you progress through a campaign, so by the time you reach the end, you’ll realize that you’ve actually learned all of the many steps required to play the game without having to try too hard to do so, which is a big plus. The second biggest element to the gameplay is building your village. During the course of the game, one of the many actions you can take is to build a structure, and you do this by paying the resources then taking the sticker off of the building card and placing it somewhere on your segment of the board. 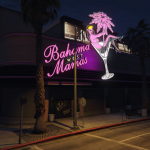 These buildings all add different options for what to do, so you start out with only the ability to gain the 6 basic types of resource, and before long there are buildings of every different type littering the landscape. One of the biggest appeals of Charterstone is probably the fact that you own what you have created, and it is completely unique to your campaign. 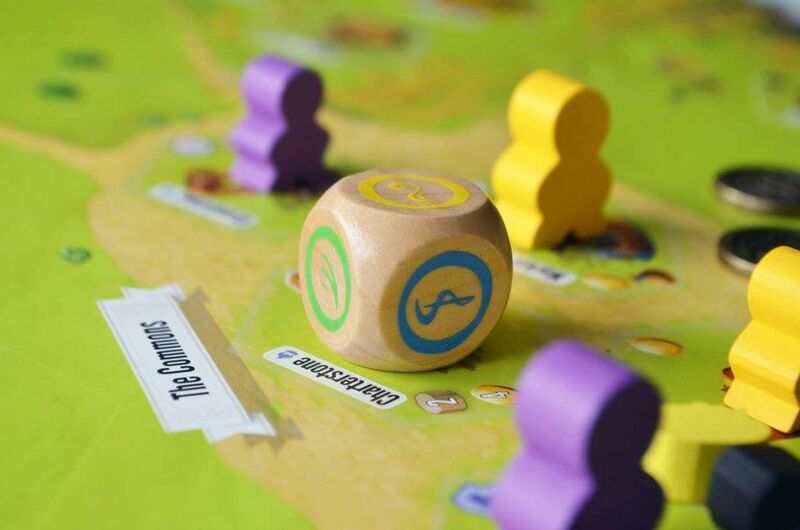 During the course of your time with the game, you see your small village grow into something approaching a real settlement, and once it’s all over, it’s like you have a custom board game that you helped to create. On top of that, you actually get to name all of the characters and places in the game, so that sense of ownership only gets stronger the more you play. 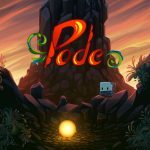 While the feeling that you create the game is pretty amazing, and the slow introduction of the many mechanics is pretty good, it does create some problems. Firstly is the fact that the sense of ownership only really applies to you, and not only will someone who didn’t complete the campaign with you have to try and wrap their heads around the rule set, but they’re also not going to have any investment in all the characters you gave hilarious names to during your playthrough. There is also a slight problem that some of the rules can be confusing in the first place, even with the downloaded FAQ at your side. The only other slight negative point is that the game works best with all 6 player slots occupied for your entire campaign, something which might be hard to pull off for a lot of people. Despite any issues with the game, it is a lot of fun, and a big part of that is the sense of mystery that comes from playing the game. You literally don’t know what the game is going to come out with next. You’re constantly discovering some new element, some new rule or some new part of the storyline, and you’re constantly making your mark on the world by changing the face of it or naming it. The visual design of Charterstone could not be more different from its long-lost-cousin, Scythe. Everything from the characters to the land around you has an art style more rooted in the cartoonish than the realistic, and everything is painted in pretty pastel colours to give the impression of peace and calm. This works well considering how relaxing the game can get at times, what with its lack of combat and laid back approach to storytelling. While the art style is very pretty and colourful, they have left room in for practicality as well. As with lots of other games, there are several meters all around the board for tracking different things, from your point totals to how good your rep is, pretty much everything is managed on the one board, other than some piles for items and objectives. Overall, Charterstone is an incredibly pretty game that is immeasurably fun to play, especially during the 12 games that set up the village and tell the main story. While some of the magic is lost after that, the game is still the sort that you’re likely to end up coming back to again and again. If you’re looking for a good legacy game to get started with, then you’re going to have a hard time finding one better suited to get you started than Charterstone. Not only that, but the game keeps surprising you, even once you think you know what’s coming. That is why it’s so important to not try and spoil anything for yourself, don’t go looking through the pieces as soon as you open the box, and don’t examine anything in the game too closely. You’ll be glad that you left it to the imagination, trust me. 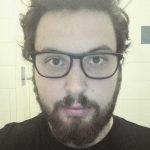 I'm a freelance writer and video producer living in the UK. I have an extensive collection of retro consoles and board games, and in my spare time I solder stuff together to see if it works. It usually doesn't. @2019 - Gaming Respawn. All Right Reserved.